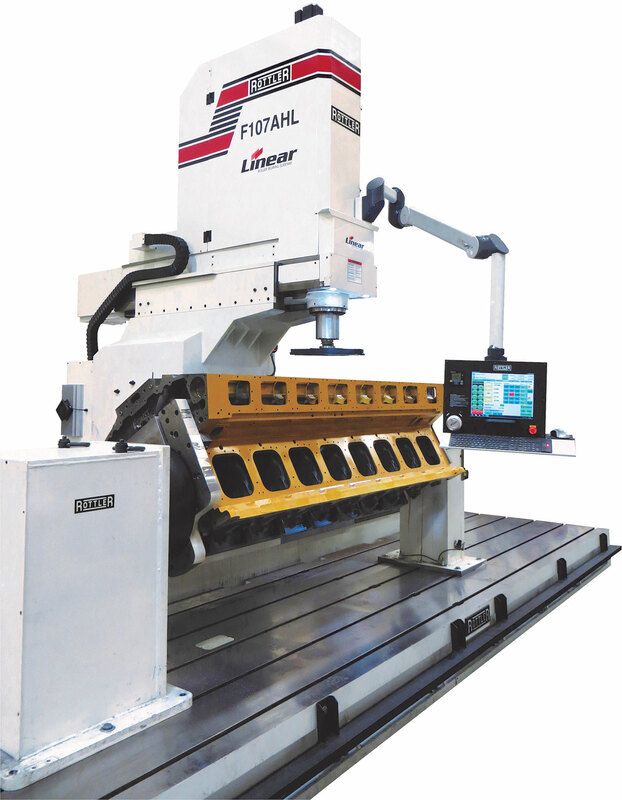 All F100 machines employ an array of features which help maximize the productivity capabilities of the machines. one set-up. 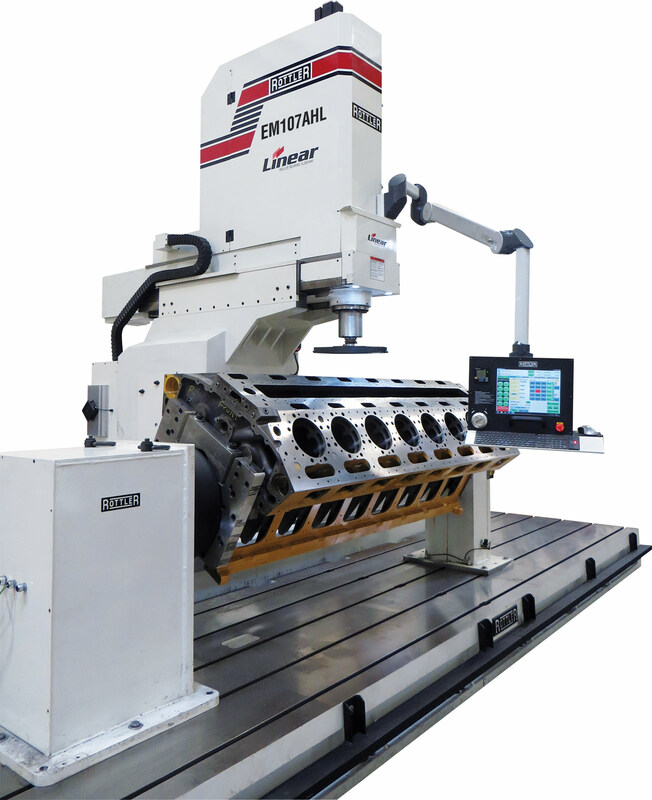 F100 Series machines have the capability of Boring, Surfacing, Line Boring, and Universal Machining. other work while the F100 completes a block bank or main line bore unattended! positioning and rapid feed rates. from boring to surfacing in less than 15 seconds! 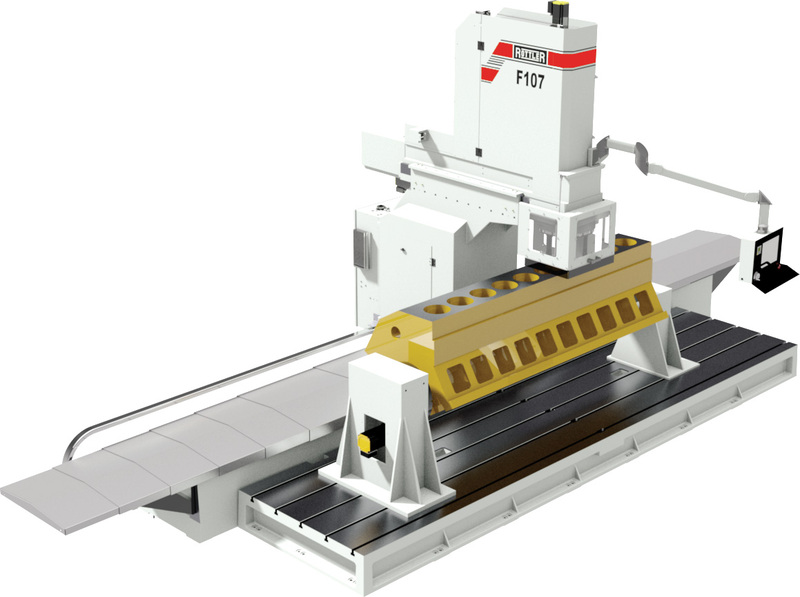 Automated workhead tilting system for surfacing provides "back clearance"
large castings to be set up and machined. Programming and Control Thru A 15"
Electronic Hand Wheel for Manual Movement - Per Click: Coarse Mode .01"
Over 20 years ago, Rottler pioneered automation by utilizing electronics and computers. Today, Rottler utilizes the latest computer technology to make automation easy to learn, versatile to operate and upgradeable for future software. Windows operating system and touch screen control make a simple operator interface. Touch screen control allows ONLY the buttons and information required for each operation to be displayed, "hiding" the complex computer functions in the background. Operators are able to learn advanced machining functions in just a few days. Common, everyday jobs such as boring, surfacing and line boring can be easily automated with the F100 machines. Operator attendance is only required for set up. The machine is able to bore along a complete cylinder bank automatically. Likewise, the machine is capable of line boring along a main line automatically. Often when surfacing a block, more than one pass is required. The F100 can be programmed for multiple passes, moving down the exact amount each pass and completing with a finish cut for the required surface finish during the final pass. Bore centers are either measured from the block or from a blueprint, then saved in the memory. 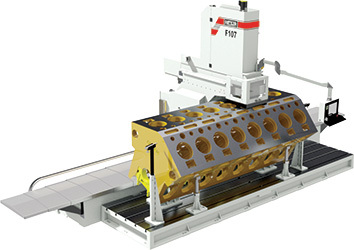 The F100 machine moves automatically to the exact positions, which is useful when multiple boring operations are required for jobs such as resleeving. For special applications, Optional Renishaw Wireless Probing can automatically find bore centers and measure diameters. When resleeving the lower seal area of wet liner blocks, it is often required to bore adiameter larger than the upper diameter. 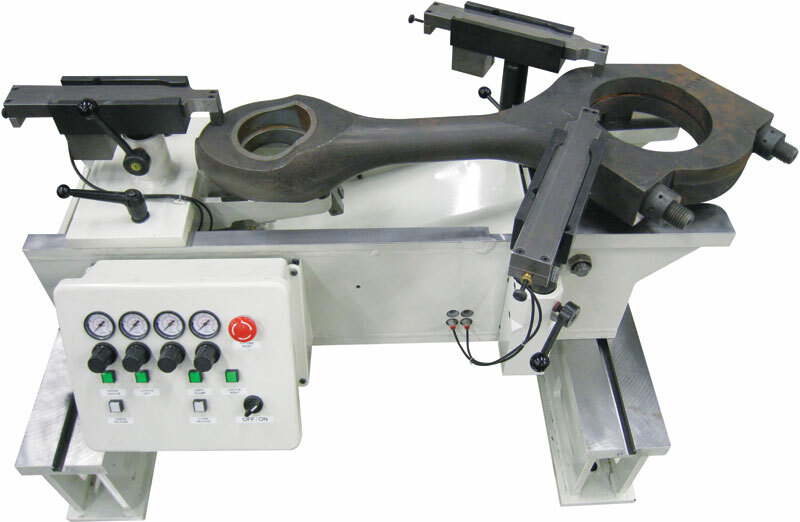 Rottler's Automatic Lower Sleeve Repair Software allows the machine to offset so that the boring tool will clear the upper diameter, move down, then move back on center to bore the lower area on center with the upper bore. 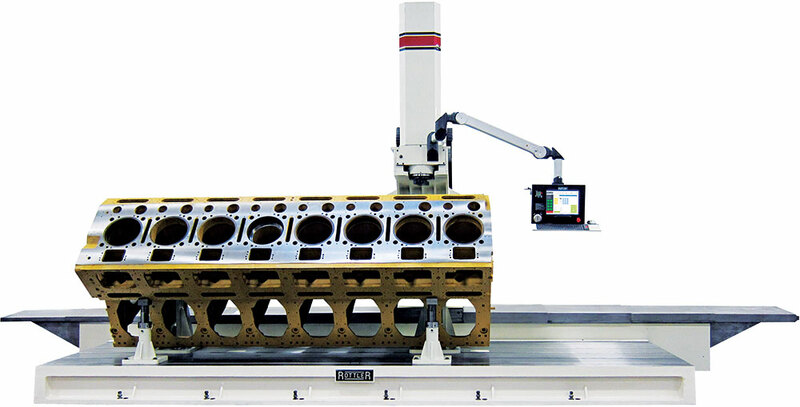 Once boring is complete, the machine will index the cutting tool, offset the programmed amount and retract and continue to the next cylinder - automatically.